Delicious recipes that allow for seasonal adjustments rank high in my book. Originally, I developed this baked quinoa dish because I wanted to use this healthy grain in a new way–and my 10-year-old isn’t fond of the texture when presented as a salad or pilaf, let alone all by itself. So, I incorporated eggs, cheese, veggies, and a few other odds and ends. Guess what? It was a hit! I truly love this dish, too. If I am lucky enough to have leftovers, this dish makes a perfect lunch or second dinner. Occasionally, I top my piece with chopped avocado and tomatoes to make a delicious, satisfying meal. As for the seasonal component, broccoli, kale, and spinach are excellent options to the zucchini. I haven’t included sautéed mushrooms yet, but that–mixed with kale–is next on my list. (If you try it first–maybe with some Asiago cheese–please provide feedback!) Feel free to change up the herbs and cheese as well, and consider trying the rinse-and-sauté method of cooking the quinoa. It adds to the nutty flavor and takes practically no extra time! For a great vegetarian meal, simply omit the ham. Lightly beat the eggs with the milk in a large bowl. Add all remaining ingredients except the Parmesan or Asiago and spread in a greased, 9×9 baking dish. Sprinkle the remaining cheese over the top. Bake for 20 minutes or until just set and the top is slightly golden. To achieve a slightly nutty flavor, I recommend rinsing the quinoa and then sautéing over medium-high heat in about a tablespoon of olive oil until dry and slightly toasted. Stir frequently so as not to burn as quinoa dries. Then, add the liquid and simmer, uncovered, over low until cooked through, about 12-15 minutes. To get the correct amount for this recipe, use 3/4 cup of quinoa and, after sautéing, add 1 cup plus 2 tablespoons water. You could also cook the quinoa in chicken or vegetable stock for added flavor. I grate the zucchini on the coarse side of a box or hand grater then squeeze excess moisture out with a paper or hand towel. This looks so good. I just got more quinoa today, I have fresh zucchini, and a potluck dinner after church this week. I know what I’ll be taking….thank you. Yay! I hope it is a hit, Nadine! Thanks for the comment and feel free to share your opinion! What an interesting use of quinoa. I’ve never seen it baked in a casserole! Beautiful! Thanks, Jackie! I thought the texture would be really good. It was an experiment that has been a hit here! Do you have any nutritional info….mainly calories per serving? I have printed the recipe and can’t wait to try it…..beautiful! As of yet, I have not done nutritional information. I have heard there are programs into which you can type ingredients to get the specifics but have not researched them yet. 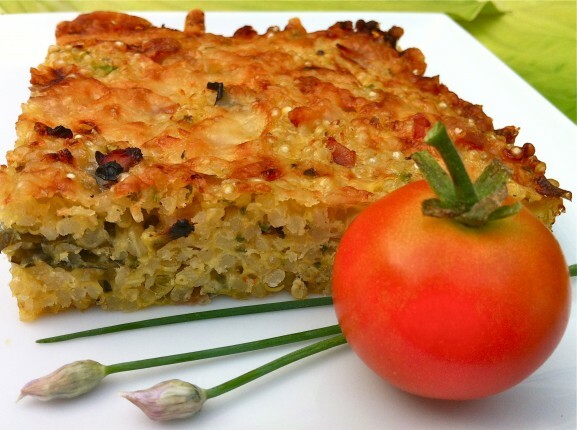 I will say there are lots of nutritious ingredients in this baked quinoa, and it’s tasty and really satisfies me: ) Let me know if you try and thanks for the comment! Made it tonight and it was stellar! I will be making this again and again. According to Caloriecount.about.com one serving is 344 calories…I used an 9×9″ square dish totaling 6 servings. Thanks again for such a wonderful recipe! I am thrilled you enjoyed it, Anita, and appreciate your passing along the calorie count. Very good to know! To me, that sounds like a very satisfying serving with a very reasonable calorie intake! Have you ever served this cold, or room temperature? I have eaten the leftovers cold because I wasn’t patient enough to let them reach room temperature! This dish is good cold; I like to top with chopped tomato and avocado for a salad-like spin also. Room temp would probably be better yet. Leftovers are also delicious reheated gently in the microwave. What a clever way to use quinoa! Bravo Ann! This recipe is one of my favorites for many reasons–but especially because it is the one way my kids actually enjoy quinoa–so that truly makes me happy. Thank you so very much, Amee! CONGRATULATIONS!! Your recipe has been chosen to be Today’s Feature Post from Cast Party Wednesday! Thank You for sharing your recipe with us! What a wonderful surprise! Thank YOU for choosing my recipe. I feel honored to have it chosen amidst so many delicious dishes! I just picked up some quinoa the other day. Thanks for sharing this on Manic Monday, now I have an idea of what to do with it!! Always looking for new quinoa recipes… and this looks great. Thanks for sharing at Foodie Friends Friday. Yum! Did mine w/ spinach and chopped grape tomatoes. Can’t wait to try it!!! Sounds like a perfect combination, Mary! I can’t wait for you to try either! I hope you will drop by and link up some more great recipes! One of the things I love about this recipe is that it’s so easy to adapt. It will be great without the ham, too! Cooking the quinoa in vegetable or chicken stock will add extra flavor as well. I just saw your recipe and I have all of the ingredients. Guess what we are having for dinner? Sounds so yummy! Let me guess…this??!! I hope you love it! Thank you for letting me know! Just had this for dinner tonight and it was awesome. Omitted the ham to keep it vegetarian. This will be a frequent dish in the summer as we try to use up all the zucchini in the garden. I am thrilled you enjoyed it, Kim. Thanks so much for your comment! I am thrilled you were inspired by the original recipe and adore your adaptations! I just shared a link on my Facebook page along with your mouth-watering photo! I doubled this batch, and OMMITTED the HAM, and got 8 servings. It was delicious. Thank you for the helpful information, Jamie. I am so glad you enjoyed! So glad you both enjoyed, Karen! Thank you for passing along the great review! this looks delicious! too bad not vegan tho (egg-free), as my son is allergic! have you or anyone else tried this without egg or with something to replace the egg? I have not tried this recipe without the eggs. Here is a link to some possible egg replacers if you are tempted to try. I hope it is helpful! Finally made this tonight for dinner. Everyone loved it! The four of us ate every last crumb. No leftovers 🙁 My husband literally scraped every last morsel out of the dish he liked it so much. Colin requested that I double the recipe next time. Big smile here, Betsy! I am thrilled it was a hit and so appreciate the comment! Just made this, smelled so good as it baked. And it tasted just as good. I am so glad you liked it, Lisa! Thank you for letting me know! This is wonderful with chopped broccoli when zucchini isn’t available! Thanks for sharing your recipes/tips. I am totally amazed that you respond to all posts! Thank You for sharing your talents! How many people does this serve as a main dish? Depending on appetite and if you have anything on the side, I would say six…four for big eaters or if this is the only thing served! 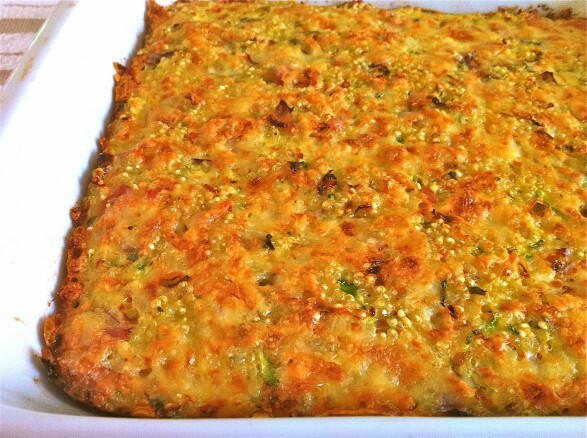 – Quinoa, Cheddar and Zucchini Bake”, do you mind in the event I personally use a number of your own tips? I am not sure exactly what you would like to use, but if you would like to link in to any of the information, you are welcome to, Lakeisha! very nice blog. Continue authoring and I will keep on viewing! This was an instant favorite the first time I made it, and in the autumn we had it several times. I hadn’t made it in a while, though, and it came up in a discussion of “healthy eating after the holidays.” Last night, in all the snow, I decided we needed comfort food after what promised to be harrowing commutes home-but so often comfort food isn’t the healthiest, and the guys I cook for are very fitness-focused. This popped into mind-but no zucchini in the house! I had some frozen broccoli, so I defrosted, drained and dried it as well as I could, and proceeded on. Our 24 year old son, living with us again until his wedding, ate half the casserole. I’d say that was a ringing endorsement! Thank you for the great feedback, Carol. I am so glad this recipe has been a hit. The use of broccoli is perfect, and it’s so easy to have a frozen bag on hand! Thank you so much for this recipe. I made it last week and just ate the last piece for lunch. It is SO good. I ‘m going to make it again in a muffin pan. Easy lunches. Yum. You are so welcome, Lynette, and I appreciate your taking the time to comment. I think the muffin cups will be great! It looks great, I think I will bake it in mini muffin tins. I’m the only one that likes quinoa. Then I can freeze them for a quick bite. I think this may be tomorrow’s dinner. Sounds perfect. Please promote the vegetarian option as it’s fantastic and cruelty free to boot! So glad you like it, Patricia!